MANILA: Prime Minister Narendra Modi on Tuesday called for intensifying regional cooperation to effectively deal with terrorism and pitched for a rules-based security architecture for the resource-rich region, seen as a veiled reference to China's expansionist posturing in the Indo-Pacific. In an address at the Asean-India summit+ here, PM Modi identified terrorism and extremism as the major challenge facing the region and said time has come for the countries of the region to join hands to collectively deal with it. "We have individually strived very hard to fight terrorism and violent extremism. It is time that we jointly address this challenge by intensifying cooperation in this crucial area," he said. The 10-nation Association of Southeast Asian Nations (Asean) is considered one of the most influential groupings in the region and India and several other countries including the US, China, Japan and Australia are its dialogue partners. 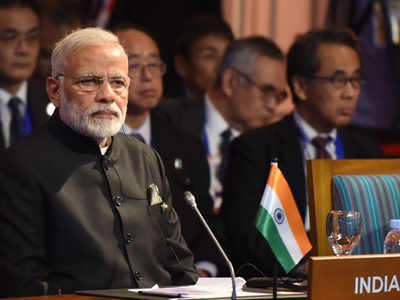 In a clear reference to the South China Sea (SCS) dispute which has cast a shadow over the summit talks, PM Modi said India will continue its support to the ASEAN for establishing a rules-based security architecture in the region. "India assures the Asean of its steady support towards achieving a rules-based regional security architecture that best attests to the region's interests and its peaceful development," he said. China's aggressive military build up in the SCS was one of the focus areas of the deliberations at the Asean summit. China claims sovereignty over all of SCS, a huge source of hydrocarbons. However, several Asean member countries including Vietnam, the Philippines and Brunei have counter claims. India has been supporting freedom of navigation and access to resources in the SCS in accordance with principles of international law, including the 1982 UN Convention on the Law of the Sea. The Asean have been pushing for a legally binding code of conduct for all stakeholders in the SCS but Beijing has been opposing such a framework asserting that it will resolve the dispute with respective countries under bilateral mechanism. Prime Minister Modi also talked about shared values and common destiny between India and Asean, adding 1.25 billion people in India were eagerly waiting to receive leaders of the ASEAN at the Republic Day celebrations in January next year. He said India is also holding a commemorative summit with Asean on January 25 next year. The ties between India and Asean have been on an upswing. The Asean region along with India together comprises combined population of 1.85 billion people, which is one fourth of the global population and their combined GDP has been estimated at over $3.8 trillion. Investment from Asean to India has been over $70 billion in the last 17 years accounting for more than 17 per cent of India's total FDI. India's investment in Asean during the same period has been more than $40 billion. Thailand, Vietnam, Indonesia, Malaysia, the Philippines, Singapore, Myanmar, Cambodia, Laos and Brunei are the members of the Asean. Prime Minister Modi also participated at a meeting of leaders of the Regional Comprehensive Economic Partnership (RCEP). The RCEP, comprising 10-member Asean bloc and six other countries -- India, China, Japan, South Korea, Australia and New Zealand, is engaged in negotiations for a free trade pact.